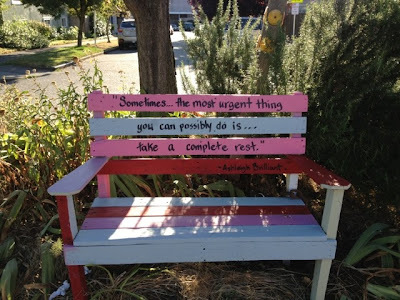 A little follow-up to Tuesday's post and another reason to meditate! One of the things that came up for me when I started this 40-day meditation challenge was TV, one of the primary ways I go unconscious. After a long day or a busy day or a large group social event I just need to relax my mind and unwind with something totally mindless. Sometimes a book will do the trick, but most often this is when I start to jones for some bad TV. I know it's a problem (and also one of the reasons why I struggle so much with my kids' need for screen time - gotta love those mirrors!) because it is the primary way I escape from what is really going on. From my fears and my hurts, my frustrations and insecurities. I use TV, and to some extent books, to go unconscious, to black out and to escape my reality. So I half-heartedly committed to "no TV" during these same 40 days. I lasted about 36 hours. On Tuesday afternoon, my son asked me to watch something with him and I thought, "Well that would be okay. We'd be doing it together...." and the next thing I knew I was knee-deep in a new addiction (My Boys). Last night, after our block party, the boys were watching a baseball game and I sat down to watch "just one episode." An hour later I was sending my husband downstairs to do bedtime so I could watch "just one more." Two hours later I was still watching. At midnight I finally finished the series and turned the TV off. Sitting in front of my computer contemplating my husband's 5:00 AM alarm I felt sick. And then I remembered Family Meditation. I had completely blown off family meditation time! Sickness turned into shame and I realized just how unconscious I had gone. So, here I am today with my screen time hangover - not all that unlike an alcohol hangover - I am exhausted, my eyes are puffy and I feel regretful of my actions last night. What if, instead of diving into a show I had come home and spent 30 minutes in meditation? What if I had sat with my feelings of exhaustion and social anxiety and need to go unconscious instead of escaping them? So TV is obviously the next thing for me to work on. My next demon to put to rest, my next dragon to slay. I am recommitting myself to "no TV" during these 40 days and I am going to try and use the time I am not zoning out to stay present, to stay conscious to my feelings, whatever they may be. I love to look for signs - that I am on the right track, that the Universe is watching out for me, that I am loved. Last week on our camping trip I found this sign at a restaurant we ate at. 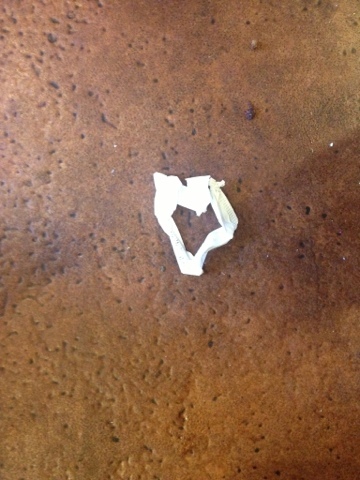 It's a straw wrapper, lying on the floor near our table, in the shape of a heart. I took it as a sign that we were exactly where we needed to be and that the Universe was taking care of us. What signs do you see today? I have always loved Raul Julia, since I first saw him as the sensitive married man having sexual tension with Susan Sarandon while solving a murder in "Compromising Positions" (the cast of which also included the always entertaining Judith Ivey - I love her voice and demeanor so much I think I could watch her in anything). He went on to play defense attorney Sandy Stern in "Presumed Innocent" and of course the beloved patriarch Gomez Addams in "The Addams Family." His was one the first celebrity deaths - in 1994 - to really effect me. He always seemed to have an undefinably quiet strength and grace. I get it now - he saw his life as a meditation - and that makes all the difference. I hope someday to be remembered for my quiet grace and thanks to Raul I have one more clue about how to do that. Thanks Raul. For everything.